At some point in a runner's life, he or she is left describing a recent marathon, race, or other quick footed experience by the vague phrase "spiritual experience." When others hear of a recent run being a "spiritual experience" the description of the run is often left at the unspecific descriptor and not questioned. Understandably so, after all, how can a personal experience be denied? Yet, when the runner says that his or her run was a spiritual experience, it assumes that he or she knows the difference between the physical and spiritual. It assumes that he or she has experienced all aspect of the physical world and is now able to label an experience as spiritual because the runner knows it is not a physical experience. It assumes that the runner is able to differentiate and not confuse the endorphin educed runner's high for the spiritual experience. But what is really happening? With numerous runners having spiritual experiences, one would suppose there to be a church of runners. Yet, I have seen few Yogis running marathons. I've not seen one bishop or noticeable cleric nor preachers or caliefs. Though, I have see rabbits running marathons, sprinting mustarded up hot dogs in 10ks, and once I was passed by a running port-a-potty in a half marathon clocking a 7 minuete mile. From my own observations, it would seem that running lends it self more to costumes than clerics, more to gadgetry's gizmos than simplicity, and more to sweat than spirituality. Though, no matter, what objections are thrown at the runner, runners continue to describe running as a spiritual experience. To search a more ancient mind, St. Paul, in his first letter to the Corinthians, tells his readers to "run the good race." In St. Paul's letter to the Hebrews he says "let us run with endurance the race has set before us." Arguably a great runner if he ever was a runner, St. Paul connects running to the spiritual life. A connection is made, but St. Paul is silent on where running and spirituality meet. So, the real question is, "Where do running and the spiritual life meet"? Can one really encounter angels in anaerobic activity or find saints in sprints? As a runner and theology teacher, I think I can help bridge the gap, as I know a thing about running and many things about theology. Ontology is the philosophical branch that studies existence and being. It is a key component of any spirituality as it points the spiritual seeker in a direction. For instance, a Christian's being is bound up in love and being God's adopted children. Therefore, The Christian is to live a live of love in which one depends on God like a child depends on his or her parents. A christian might simply state that as one lives according to God's Will is to become. Amby Burfooot, author of 'The Runner's guide to the means of life' takes a similar approach when he says that "as we run we become." Burfoot, connects being to the running experience. At the heart of running lay this one principle of being and becoming. Though silent on what the runner becomes, Burfoot sees running as a vehicle to that ontological discovery of being. Moreover, Burfoot does not make the mistake of echoing past philosophers in suggesting that to run is to be. For if one were to ever stop running, they would also stop being. Instead, Burfoot sees running as a means to an end. As it is in running that being is found for the runner. The goal for the Christian is to be perfect as God is perfect in Heaven. No easy task. The goal of the Buddhist is to obtain Nirvana. The goal of the Muslim is to conquer the unrest in the soul and obtain peace and justice in the world. These goals can only be obtained through much pushing of oneself. Nobody knows what they cannot due until they try. One aspect of racing happens before the race. It's goal is in perfecting the person who is running. The outcome of all the mileage logged is to become a more perfect runner. A runner can be content with doing a 10 minute mile, but a runner cannot become a more perfect runner without first pushing himself or herself. After all, you never know how far and fast you can run till you try. Chances are you can go faster and farther than imagined if only you unleash yourself. There is an old bumper sticker that reads something to the effect, "As long as there are tests in school there will be prayer in schools." Likewise, as long as there are marathons and foot races, there will be prayer at races. There comes a point in every marathon when a person hits the proverbial wall, where every step feels as if you're dragging your kids on each foot kicking and screaming, and no matter how many times you listen to "Eye of the Tiger" or how many energy gels quaffed, moving forward feels like an impossible task. In the heat of the moment a whispered and gasped prayer of sincerity escapes the runner's lips, "God help me." 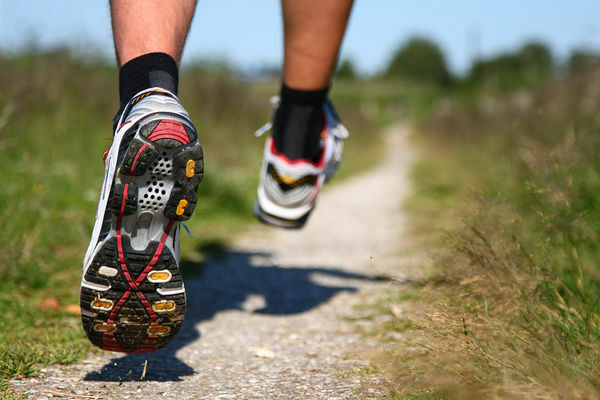 Perhaps the runner barters with God, "If you let me finish God I'll go to church on Sundays." Though I don't recommend this kind of spiritual economy as the problem comes when God actually answers your prayers. Are you really ready to commit to your end of the deal? However, it is only in prayer that the runner perseveres and breaks through the wall to finish the race. The spiritually minded know that prayer is not about asking God for the best new pair of running shoes and praying for your sick Aunt, though you can certainly pray for those things. A key component in prayer is breaking down walls so that you can finish your own race. Taking St. Paul's analogy from first Corinthians the race is the life we live and those who finish the race are those who make it to paradise with God. As St. Paul reminds his reader, it is not in vain that the Christian runs it is not for the sake of the race that a person runs. It is to finish the race that the spiritually minded run. Fast or slow, the finish line is the goal. As the Nike poster used to say, as well as the lesson from the tortoise and hare story, "The race is not always to the swift, but to those who keep on running. " Why don't some people make it to heaven? Again, using St. Paul's analogy, they quit the race and therefore they ever finish. They are defeated by their own spiritual wall, and thereby spend the rest of eternity watching others enjoy the cold orange slices, ice cold beer, delicious post-run delights, and leg massages. The British writer, G.K. Chesterton once said, "You cannot grow a beard in a moment of passion." Rightly so, growing a beard, and making it a good stylish beard, takes discipline and patience. In the realm of religion and spirituality, the concept and practice of discipline and training is known as askesis. In the history of religions, there has not be found a religion that did not practice some form of askesis. The most noticeable of ascetical practices universally held in the religious sphere reside in the practice of daily prayer, dietary regulations, and physical discipline. Such practices were undertook so as to teach the body to listen to the soul and to teach the soul not to listen to the body and in doing so the ascetical practicioner gains more freedom in the world by limiting the pleasures in which they partake. Askesis is nothing new in running. Athletes have made firm use of ascetical practices for millennium who make firm use of the mind over matter principle in many aspects. To train the body to arise at 4:30 A.M. takes certain will power over the body which screams "30 more minutes." To squeeze out two more tempo runs when the body is aching for air. To run 10 miles when your legs say, "only two today." To fall on one's knees and do one more Our Father when the knees ache in distaste requires physical discipline, as well as mental discipline to realize that the pain is only strength's first fruit. Every runner, at least, every serious runner, is by nature a firm practicioner of dietary asceticism. Knowing when to eat proteins over carbohydrates and vice versa. Knowing when it is ok to indulge in chocolate birthday cake. Knowing whether grilling or pan frying is the healthier choice. Granola for breakfast or yogurt and oatmeal? Askesis is needed in running so the runner will have greater freedom in the race. The most disciplined runners are often the best runners, and therefore know how hard they can push their bodies and when they need to let a person pass and whether or not it is time to break rhythm and challenge the first runner. In other words, the ascetical runner is not a slave to the race but it's master. Friendships formed around spiritual matters are often the strongest of friendships. As it allows two people to join together in an attempt to overcome what can seem like an impossible task. Prayer might be an individual action, it is never done alone. On the race course, some of the strongest friendships are formed in the most difficult of runs as participants engage in a common seemingly impossible task. In which, each runner provides encouragement to the other. Training can be done solo, but racing is never an event done alone. Due to the nature of a race being a communal event, it is impossible for racers and runners not to brought together in a bonding moment of extreme exhaustion. In short, is running a spiritual experience? Certainly, one can have a spiritual experience while running or on the run, but every experience had while running is not necessarily a spiritual experience. What is certain, is that there is much overlap in living a spiritual life with living the life of a runner: being, prayer, perfection, discipline, community. So get off your duff and start running and start praying.